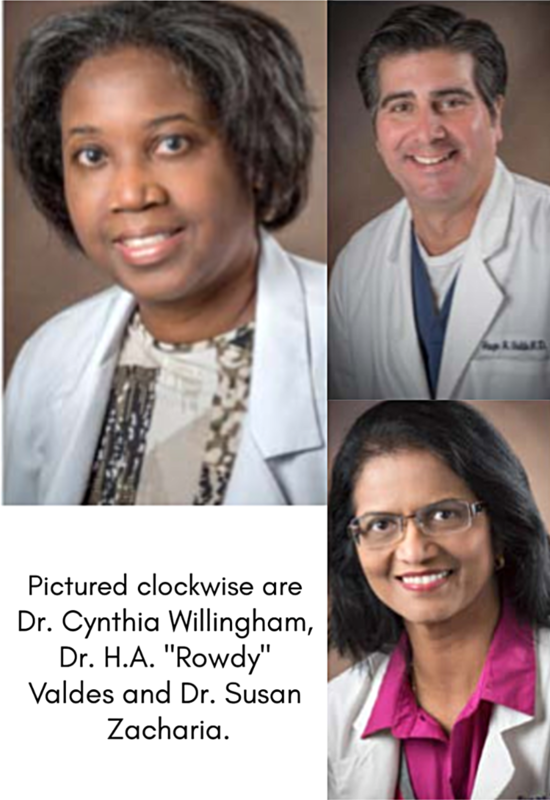 Three area physicians have been selected by their peers to serve on the North Oaks Rehabilitation Hospital Medical Executive Committee for 2019. These officers will serve as liaisons between the medical staff and the North Oaks Rehabilitation Hospital Board of Managers. Serving as chief of staff is Physiatrist Cynthia Willingham, MD, PLLC. She earned her medical degree through the University of Arkansas for Medical Sciences in Little Rock. During her residency at the Medical University of South Carolina in Charleston, she served as chief resident. Certified by the American Board of Physical Medicine and Rehabilitation, Willingham joined the North Oaks medical staff in 2018. Members-at-large include Family Medicine Physician H.A. “Rowdy” Valdes, MD, and Internal Medicine Physician Susan Zacharia, MD. Valdes is a graduate of Louisiana State University School of Medicine in New Orleans. He carried out an internship and residency through the University of Alabama in Tuscaloosa. He is certified by the American Board of Family Medicine and joined the North Oaks medical staff in 1999. Zacharia earned her medical degree from the Universidad Tecnologica de Santiago in Santo Domingo. She completed an internship and residency at the University of Texas Medical Branch in Galveston, Texas. She is certified by the American Board of Internal Medicine and joined the North Oaks medical staff in 1995. For more information about North Oaks Rehabilitation Hospital, contact North Oaks Public Relations at (985) 230-6647 or visit www.northoaks.org. For a physician referral, call the North Oaks Physician Referral Line at (985) 230-DOCS (3627) or visit the “Find a Physician” link at www.northoaks.org.